Three young researchers have determined that Sri Lanka has its own species of fan-throated lizards – creatures that puff out an extraordinary frill around their throats to warn off intruders – and that in fact the island has two distinct varieties. Until now it had been assumed that the fan-throated lizards found in Sri Lanka were the same as in India. Researchers Thasun Amarasinghe, Sameera Karunarathna and Madhava Botejue studied lizard specimens in the Calcutta and Chennai museums and realised the Sri Lankan lizards were different. They widened their research to fan-throated lizard specimens at other foreign museums and confirmed their theory, also finding that Sri Lanka has two species of this lizard: one found in the south-eastern coastal belt from Bundala to Kumana and another in the north-west, north of Puttalam. The two species were named Sitana devakai and Sitana bahiri to honour leading biologists Professor Devaka Weerakoon and Professor Mohammed Bahir. “Prof. Weerakoon was one of the first scientists to initiate research on the biodiversity of the north of Sri Lanka after the restrictions of the war ended so we named the lizard found in the north, Sitana devakai,” Sameera Karunarathna said. The team also wanted to honour Mohammed Bahir for his extensive research that established freshwater crabs as the biggest endemic group in the country. Since he came from the southern part of the island the fan-throated lizard found in the south was named Sitana bahiri. The fan-throated lizard, just 5cm long, mostly inhabits coastal areas including sand dunes, hence its Sinhala name weli katussa (sand lizard). Its hind legs have four toes unlike other lizards that have five toes. The researchers say this adaptation helps them to live in arid areas where temperatures are high and to move about efficiently on sand. The most interesting feature of the species is the pouch on the throat of male lizards. When a territory guarding lizard spots an intruder, it quickly advances on the trespasser and oscillates this large, coloured pouch in a display of threat. The frill found on Si. devakai is pink and blue while S. bahiri is less colourful. The findings, by Mr. Karunaratna, Mr. Amarasinghe, Ms Botejue and two colleagues, Ivan Ineich and Patrick Campbell were published in the prestigious journal Zootaxa earlier this month. Last year, Mr. Karunaratna and Mr. Amarasinghe took the lead in finding two other endemic lizards, Calotes pethiyagodai and Calotes manamendrai (both from the Knuckles forest) named after Rohan Pethiyagoda and Kelum Manamendra-Arachchi who contributed towards the country’s biodiversity. Sri Lanka is home to 21 species of lizards, 19 of them endemic to the country. The Kandyan Dwarf Toad, dubbed the world’s rarest toad, has become a more select amphibian with the discovery that it shares its genus with only one other species, not two as previously thought. The toad, a member of the Adenomus genus, was discovered and last seen in the 1870s and had been thought to be extinct until it was found again in 2009. Naturalists believed there were three species in the genus but now say DNA analysis reveals that one of them, Dasi’s Dwarf Toad (Adenomus dasi) is, in fact, the Kandyan Dwarf Toad “in disguise”. The other species is Adenomus kelaartii (Kelaart’s toad). One factor that led to the error in identification is that Adenomus kandianus has fully webbed toes while Adenomus dasi has partially webbed feet. “When amphibian specialists Kelum Manamendra-Arachchie and Rohan Pethiyagoda were describing Adenomus dasi in 1998 they were actually describing a slightly different mutate of A. kandianus as they had access to only a few specimens,” said lead researcher Dr. Madhava Meegaskumbura of the Faculty of Science at the University of Peradeniya. Mr. Pethiyagoda and Mr. Manamendra-Arachchi are co-authors of the new research paper, published in the prestigious international journal Zootaxa. “They contributed with their previous data and knowledge, did additional measurements and contributed to the writing, making this a collective effort and a better story,” Dr. Meegaskumbura said. 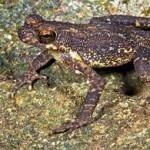 Dr. Meegaskumbura said the research team had been glad to find a large population of hundreds of these toads at one location; the toads, endemic to Sri Lanka, are on the critically-endangered wildlife list. Sri Lanka is home to 119 amphibians with as many as 102 of them being endemic, making this country one of the hottest hotspots for amphibian diversity in the world. There are eight species of toads in Sri Lanka, belonging to two genera called Adenomus and Duttaphrynus, and six of them are endemic to the country.